Nathalia’s dad has been embarrassing her since before she was born. For instance, it’s his fault that she has the world’s worst surname and has collected more hideous nicknames that she can count on both hands AND feet. 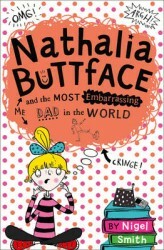 It’s not easy making friends when you’re (not exactly affectionately) known as Nathalia Buttface. Or worse. And don’t even mention Dad’s old van so full of junk it’s like a bin on wheels – and prone to do things like burst into flames in the school carpark IN FRONT OF EVERYONE IN NAT’S CLASS. … but with the same old Dad. Unfortunately. A hilarious new series for girls from TV and radio comedy writing talent Nigel Smith.